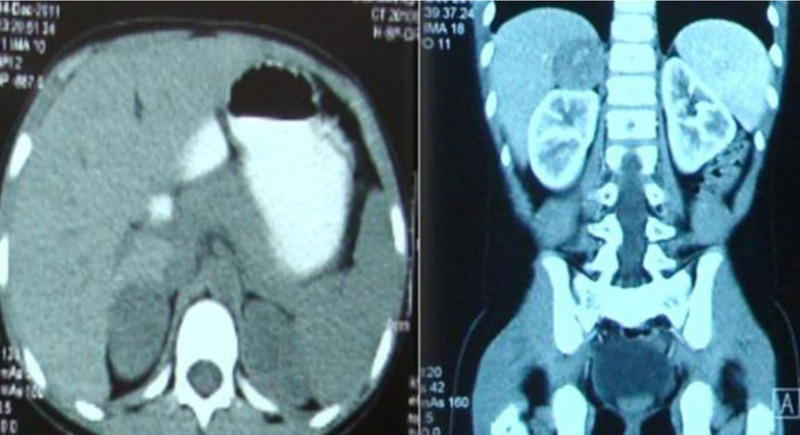 To Cite: Pavaman Sindgikar S , S Joshi S, Shenoy V. Feminizing Adrenal Tumor: A Rare Presentation, Iran J Pediatr. 2014 ; 24(2):225-226. Malignant adrenocortical tumor (ACT), a rare entity with an incidence of 1-2/million, is uncommon in pediatric population. These tumors are functional with varied endocrine syndromes, most frequent being rapidly progressing Cushing syndrome with/out virilization. In males estrogen-secreting tumors lead to gynecomastia and are invariably malignant. The modality of treatment is surgical resection of tumor by laparoscopy or open laparotomy followed by chemotherapy in selected cases based on new Union International Contre Cancer (UICC) staging by WHO. Laparoscopic adrenalectomy as safe choice of surgical approach is being extensively described in recent literature. The prognosis depends on the tumor stage and five-year survival in different series ranged between 16 and 38%. We report on a feminizing adrenal tumor in a six year old male child who presented with bilateral gynecomastia for its rarity. invasion was noted in microscopic examination. Though tumor size was less than five cm, it was classified as stage 3 based on UICC staging in view of micro metastasis. Post surgically, child required cortisole replacement for 48 hours. Chemotherapy was administered with cisplatin and etoposide in cycles at monthly intervals for six months. At one year follow-up, the serial hormonal assays are normal and gynecomastia is regressing (Fig. 1B). Adrenal neoplasm has unknown etiology but cytogenetic cloning studies have described characteristic chromosomal abnormalities. Usual age of presentation is fourth decade and in childhood median age is three years with female predominance. Feminization syndrome is rarely observed presentation and in a recent review, the prevalence of these tumors ranged from 1%-2%. Estrogen and derivatives like estradiol, estrone are predominant hormones secreted, resulting in gynecomastia in males. Feminizing syndrome usually regresses after removal of tumor but rarely requires mammoplasty. In the above case normalization of hormones in follow-up indicated successful resection of tumor not warranting any corrective surgery. Treatment of ACT consists of radical open surgery, en bloc resection of tumor, adjacent infiltrated organs and/or regional lymphadenectomy, however laparoscopic removal is possible in stage 1 and 2. Decision for laparoscopic removal was based on imaging findings as it can be safely performed even in malignant forms of adrenal tumors. Definite staging with detailed pathological classification is assessed after the surgery. Due to unavailability of mitotane in our country cisplatin and etoposide were used for chemotherapy. There are no well controlled studies to compare the benefit of mitotane and other drugs as first line therapy. Adrenal suppression of the contralateral adrenal gland is seen during post-operative period requiring replacement therapy from days to weeks. Large size of the tumor and invasion of the adjacent organs mark poorer prognosis. Recurrent symptoms or biochemical abnormalities should prompt a careful search for metastatic disease. Functional ACT of childhood is a rare entity and presents with rapid clinical course prompting an aggressive approach in diagnosis and management.